Dentist Chicago, IL - Reuben D. Collins, D.D.S. Oral Health Screening … There is an oral cancer screening tool available. Velscope uses technology that has proven successful in identifying soft tissue abnormalities. 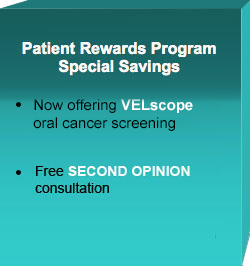 An annual Velscope exam, in combination with a regular visual examination, provides a comprehensive oral screening procedure for patients at increased risk for oral cancer. The Velscope exam is painless and fast, and could help save your life. Follow the link to view the Good Morning America segment on HPV Oral Cancer: Who's at Risk? At Reuben Collins DDS, we value our patient relationships, making it our priority to deliver gentle compassionate care that you deserve from a dentist in Chicago. We work hard to make you feel at ease by providing exceptional patient care in a relaxed, convenient atmosphere. We strive to develop lifelong relationships with our patients by combining the latest dental technology with a professional and compassionate staff. The result is a beautiful, healthy smile that lasts a lifetime.